Most designers, contractors, and home professionals will tell you that the best way to instantly update and enhance any room is to add a new coat of paint. Quick, affordable and dramatic, paint allows many residents and business owners the opportunity to change the dynamic of any space without the cost of a full remodel. 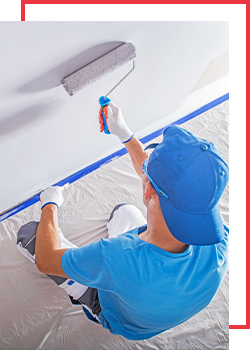 As your local construction company, we offer interior and exterior painting expertise for both residents and business owners alike. Offering cleaning, scraping and sanding, we provide comprehensive wall and siding preparation before applying even a single brush of paint, ensuring a flawless look. From basic one-color surfaces to decorative techniques, including marbling, faux stone, distressing and color washes, we’ll deliver the unique, alluring look you’ve been envying. Backed by more than a quarter-century of experience, our home painting team is a fundamental part of our family, delivering unparalleled workmanship in all that they do. Courteous, prompt, friendly and highly-skilled, we promise our focused attention, delivering affordable, yet uncompromising service with each step. Find out more about the Diversified Construction team and how we can help you save a pretty penny on painting by calling our customer care team today. We promise a quick response and a friendly smile as well as free estimates. Don’t hesitate to contact us now.